Although the rules of Inka Trail Expeditions, says that reservations must be made five days before, we recommend you make your reservation well in advance, the average peak indicates that 90 days before departure and there's no room, this because it can only be 500 people per day, just so you can keep from erosion and pollution of the road network and the Sanctuary of Machu Picchu. where we will go see pictures que landscapes, until the Km 104 where we began our trek. From the archaeological site of "Chanchabamba" (2250 mts) went up by approx. 2 1 / 2 hours to the fascinating archaeological site of Wiñaywayna (2650 mts) where we enjoyed a picnic. In the afternoon we follow the semi-tropical forest to the "Intipunku" (the Gate of the Sun) of where we can enjoy the first panoramic view of the majestic Machu picchu. 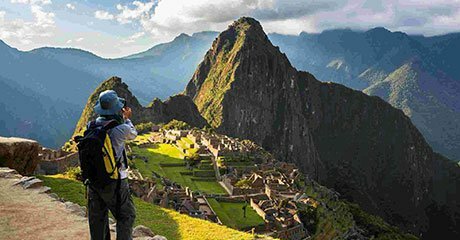 From here we descend walking to Aguas Calientes where you can optionally visit the thermal baths and comfortably spend the night in a hostel can this be the Inka Tambo Hostal, Hostal Continental, Hostal Royal Garden, among others according to availability.